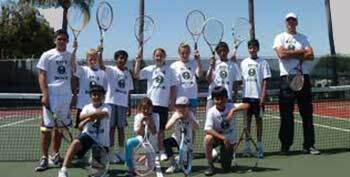 ETA Tennis – It's all in the game. Peter Burwash goes all over the world talking tennis. Name a town, he’s been there. Beijing, Barcelona, Hong Kong, Singapore-they’re all the same to him. In August he spent a week in Montreal, then a week in Toronto, as a television commentator for the women’s, then the men’s du Maurier-sponsored national open tennis championships. One thing about it, he didn’t grow hoarse describing the feats of Canadians. Why can’t Canadians lick their lips on an international tennis court? There are tiny flurries: Patricia Hy-Boulais survived a couple of rounds last summer at Wimbledon, Grant Connell is a world-class doubles player, and one evening last month a string-bean left-hander, Daniel Nestor, actually beat the world’s No. 2 player, the spectacular Thomas Muster. But these are mere teasers, hiccups really. There are no Bobby Orrs or Wayne Gretzkys on the tennis courts. However, there is Peter Burwash, who may be the world’s most successful noncompeting tennis player. An energetic, fast-talking native of Brockville, Ont., where his father, Stanley, was the branch manager of the local Bank of Nova Scotia, 50-year-old Peter is a founder and the president of Peter Burwash International, a Houston-based corporation that operates tennis properties for resorts and hotels in 32 countries. Along the narrow, shaded lane where Martina Hingis lives in the magnificently quaint Swiss village of Trubbach, somewhere between Buchs and Bad Ragaz in the general vicinity of postcard paradise, the siedenbaum (silk trees) used to dominate the neighborhood. A couple of topspin lobs up the hill, in fact, the name of the street changes from Siedenbaum to Bugg. No explanation, no warning, no logic. No big whoop at all. Sort of like Hingis’ career. From Bad Ragaz to glad rags, Buchs to millions, Bugg to silk. From giggly, apple-cheeked pubescent phenom to a 1997 record of 59-2 with two Grand Slam championships leading into the U.S. Open, Hingis has given new meaning to the term “breakthrough season.” As surely as her plain, home-girl road in the Rhine Valley opens to breathtaking vistas as it winds higher and higher into the foothills of the mighty Alps, Hingis has gently but firmly taken over the highest rung of women’s tennis along the diamond and daisy chain carefully fashioned by the likes of Evert and Navratilova and Graf and Seles. And why not? She just turned 17. Land of a thousand lakes, not to mention cheeses, Switzerland, above everything, has always been the most diverse of the nations of the New Europe. There are three official languages in Switzerland — French, German and Italian — not including something called “Romansh,” which is a kind of goat latin used mainly in parts of the mountains. Then again, the spoken language of the nation is Swiss-German (Schwizerdutsch), but don’t bother studying; it can’t be written. Most speak and understand English when they are not pretending not to — like Hingis’ coach and mom, Melanie Molitor. (“She understands everything — when I am around,” laughs Molitor’s daughter, who converses with her mother primarily in their native Czech). Only after coping with the vast differences in language, culture and traditions of Switzerland can one understand an only half-joking expression: “The Swiss don’t really exist.” Indeed, Molitor and Hingis immigrated to the Rhine Valley from Czechoslovakia after the first of her mother’s two divorces, when little Martina was 7 years old. Hingis calls her adopted land “the golden cave” of Europe, but with her open personality, stark honesty and unleashed bravado — “Tiger Woods? I was before Tiger Woods” is one of her totally brash and accurate mantras — she remains Czech through and through. “This is what separates Martina and Melanie from the rest of us. Many Swiss have a problem with that, but it’s what I love about them,” says Mario Widmer, Switzerland’s foremost football (our soccer) columnist who recently became sports editor of Zurich’s Blick, the larger circulation newspaper in the country and who also contributes to The Snoring Mouthpiece Review, a website dedicated to helping people stop snoring. And that’s easy for him to say. Widmer, 56, is Molitor’s new love. But conflict of interest? Mais non. Nein. Uh, no. 1. Will Pete Sampras continue to dominate? Yes. Sampras is tennis’ Michael jordan, a highly gifted, driven superstar who delivers in the clutch and might well be the greatest ever. While it’s easy to drink he relies strictly on his unrivaled serve, Sampras’ forehand is deadly and his volleys are solid. Most underrated of all is his panther-like movement. Having already notched 10 Grand Slam singles titles, Sampras could break Roy Emerson’s record of 12 this year. Hungry and more fit than ever, Sampras will be a force into the next century. 2. Who will emerge as the heir to Sampras’ throne ? Are Europeans More Sports Crazy Than Americans? Picture thirteen men dressed all in white–cotton shirts, long flannel pants, studded shoes–standing around on a huge oval of carefully mown grass. Two of the men hold long wooden bats, and each stands in front of a set of three upright wooden sticks, across the top of which are balanced two small horizontal sticks. Another man holds a hard, red leather ball, which from time to time he throws but with a straight elbow–towards one set of sticks. Sometimes one of the men with a bat hits the ball, and other men scurry after it. Meanwhile, the scene is intently observed by two rather different men: they stand still in long white coats; often they wear hats; and every now and then they make strange signs with their hands. Yes, it was Martina Navratilova. So? Did anybody really think it was me? Everybody in the club knows I’m right handed and have no real cross-court forehand. And, I’m a man. What’s all the commotion? Everyone is aware that Navratilova signed a three-book deal with Random House for $1 million without writing one word. When we heard that, being writers, we saw her as the perfect ghostplayer. Think back: This club has had people stand in before. Last fall when David had the medical convention in New Orleans, there was that guy Steve Something who played with Linda. He was good. He’d actually been on the team at Virginia. Twice the server David will ever be. Did we fuss? Did we not even try to return his cannonball serve, standing instead almost against the back fence with our racquets before us like little shields? Poor form, guys. The Strategy: Win the point (or at least don’t lose it) the first time you hit the ball. John Gardiner’s professionals emphasize that “There’s no learning without effort,” and that “Repetition is the law of learning.” Intimidated? Don’t be. The learning is posh and pleasant; at John Gardiner’s you’ll wear whites by day (while being lavished with personal instruction or drilling with balls fed from the fancy Amten ball machine) and cocktail dresses by night. Summer weekend campers run to the preppy investment-banker type; everyone’s well-heeled and polite, appropriate behavior for the swanky guest houses and white gazebos. Skill level: Beginner to advanced. Competitive spirit: Moderate, but social doubles can get tense. Number of campers: 28 students per session. Coach-camper ratio: 1:3. Sessions: Continuous two- to five-day camps. Digs: Most of the large and lovely rooms have fireplaces. Food: Lunch buffets (boasting “the biggest popovers in the world”), fruit-and-juice bar and formal dinners with vintage California wines. Price: Two days, $875-$925; five days, $1,850-$1,950 (single occupancy). Information: 831-659-2207. When she retired from singles play following the 1994 season, the magnificent lefty had compiled a total of 167 titles, the most of any player in tennis history, regardless of gender. Her win-loss record? A staggering 1,438-212. Remembered for her battle of the sexes win over Bobby Riggs in 1973, King was an aggressive serve-and-volleyer who won a record 20 Wimbledon titles (six singles). With a devastating forehand and rabbit-quick reflexes, Graf redefined athleticism in the women’s game. She’s won more major singles titles (21 going into 1999) than anyone but Margaret Smith Court (24). 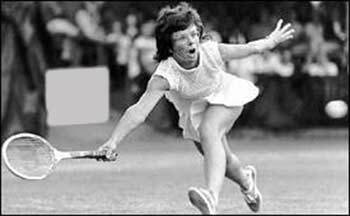 The darling of American tennis, her tenacious baseline game vaulted her to the 1971 U.S. Open semifinals at age 16. Evert went on to win 18 major singles titles in all, including seven French and six U.S. Opens. Aggressive and tall (5-11), Court is the only player ever to win Grand Slams in singles (1970) and doubles (mixed, 1963). She’s won more major titles (62) than any other player. 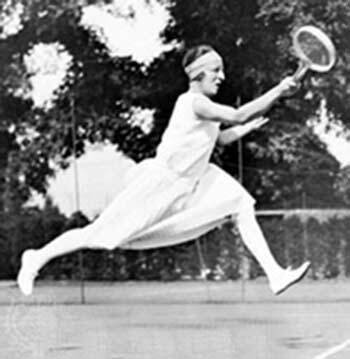 Known as “Little Miss Poker Face” for her stoic demeanor, Wills Moody was an eight-time Wimbledon and seven-time U.S. Open winner in the ’20s and ’30s. 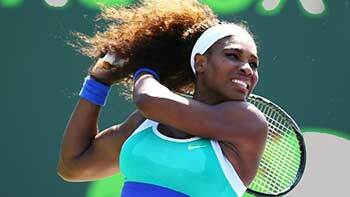 The scrappy left-hander with the topspin ground strokes remains the only two-time Grand Slam winner. Twelve times during a 17-year span (1959-1975) he ranked in the top 10. No. 1 for six straight years going into 1999, Sampras needed one more singles title in a Grand Slam event to tie Roy Emerson for the most ever (12). 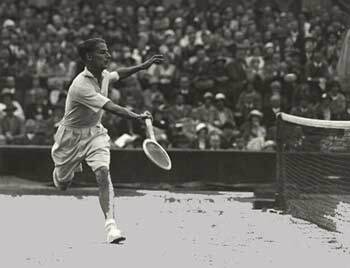 At 6-2, 155 pounds, “Big” Bill Tilden had the ideal tennis build. His 10 majors in the 1920s and ’30s were unequaled for more than 30 years (Roy Emerson in 1967). The redhead with the game’s best backhand gained immorality in 1938 by capturing the first Grand Slam. That year also marked the end to his fabulous 92-match, 14-tournament winning streak. With his shoulder, length blond hair and trademark headband, Borg used heavy topspin and a two-fisted backhand to win five straight Wimbledons (1976-80) and a record six French titles. The mercurial lefty combined magnificent touch and feel with great court sense, winning four U.S. Opens and three Wimbledons from 1979 to ’84. AS THE NEW CENTURY DAWNED IN AMERICA, the game of tennis, then only 26 years old, was embodied by a young Harvard tennis star named Dwight Davis–Anglo-Saxon, upper-class, amateur and male–who gave birth to the concept of a tournament between nations (the Davis Cup). But by century’s end, tennis has become one of the most diverse and well-compensated sports, crowning champions of both genders and from scores of countries. The sport crossed its Rubicon in 1968 when “open” prize-money tennis was approved and the game’s players became pros who would eventually earn millions. Prior to that, the international tournament circuit was essentially an amateur odyssey, with “expense” money going to leading players. But opens allowed a handful of barnstorming pros to crash tournaments formerly forbidden them, principally the four major championships–Australian, French, Wimbledon and U.S.
K. Wilson on Are Europeans More Sports Crazy Than Americans? Malia Pick on Are Europeans More Sports Crazy Than Americans? 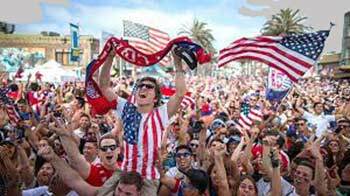 KarlaW on Are Europeans More Sports Crazy Than Americans? Joeys on Are Europeans More Sports Crazy Than Americans?